Everybody knows James Gandolfini as Tony Soprano, the fictional New Jersey mob boss on The Sopranos, for which he was brought home two Emmy Awards for Outstanding Lead Actor in a Television Drama Series. However, audiences also recognize him from a wide variety of other roles where he has reflected significant range as an actor. There were memorable tough-guy parts that he played in Get Shorty and True Romance (playing a henchman for lead mob villain Christopher Walken), his portrayal as a Colonel in The Last Castle (opposite Robert Redford), and his role as a hitman in The Mexican (starring Julie Roberts and Brad Pitt). 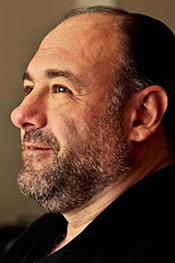 Gandolfini began his acting career in New York theater, making his Broadway debut in the 1992 revival of Tennessee Williams’ A Streetcar Named Desire, with Alec Baldwin and Jessica Lange. He has given us so many great performances over the years and is now giving us some of his family’s Italian recipes. I spoke with Gandolfini about his love for his mother’s cooking, his father’s cooking, and the prop food on the Sopranos. Were there a lot of people of Italian descent in the town you grew up in? When I was growing up in Park Ridge, New Jersey, the town had many Italian immigrants living there. In fact, my own mother and father were born in the northern part of Italy and emigrated to New Jersey. My mother was originally from Milan. Have you traveled back to your family’s roots in Milan? I have had many great visits to Milan, but haven’t been back for about fifteen years. I’d like to go again, but, unfortunately, I never seem to have the time. When I get the chance to visit again, I hope to bring my son, Michael, if he wants to go. What were summers like in New Jersey for your family? Growing up, I along with my family, would spend our vacation time at the Jersey Shore. But wherever we were, my mother cooked all kinds of great Italian dishes. My two favorites would have to be her osso bucco and polenta, which I am going to give you the recipes for. Did your mother do all of the cooking in your home? I’ve got to say that my father was talented in the kitchen as well. I loved all of his spaghetti and pasta dishes. The funny thing was that we didn’t use a lot of tomato sauce because my family didn’t like it. Tomato-based sauces are a tradition of southern Italy and my parents came from the north, so we enjoyed meat-based sauces instead. My mother was a lunch lady in the local school cafeteria, so I also ate a lot of hot dogs and grilled cheese sandwiches. How is the prop food we see you eating during the scenes on Sopranos? I’ve got to tell you that the prop Italian food on The Sopranos is terrific. If I look like I’m enjoying the food on the show, that’s because I am. (Our prop guy used to get the food from an Italian deli in Park Ridge – my old hometown.) I like the prop food so much that I eat it in between takes as well as on camera.